1. Do as the Venetians do and wear an historical Venetian costume. Be sure to don a mask and parade along the alleys, bridges and squares. 2. 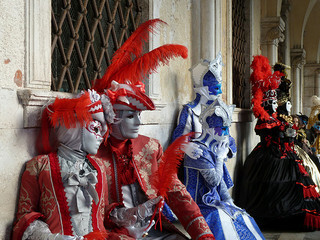 Once you’ve got the costume, the ultimate Carnevale experience is to attend a masked ball. The Luna Hotel Baglioni hosts a 6-hour extravaganza complete with opera performances and even a DJ. Or enjoy Dinner Dansante “Le Menuet” at the Hotel Danieli where a dance master and a baroque quartet will involve people into traditional group dances such as minuets. 3. Whether you’re going to a ball or not, don’t miss the chance to learn Cotillion dancing, an essential part of any Carnevale costume ball. The Cotillion The ”Cotillion” is a French dance dating back to early 18th century. The lady had a starring role in the “dance-game”: it was her role to entice her desired partner so he would invite her to the dance itself. Little gifts were handed out at the end of the dance. 4. Take a Carnevale-themed photo tour of Venice. La Serenissisma is ideal to photograph year-round but with all of the folks parading around in colorful masks and costumes, now is a great time to get out the camera and venture into lesser-known Venice neighborhoods such as Castello and Cannaregio. final bar you will have the chance to try the popular Venetian Spritz. 6. Learn the secrets of Venice’s Carnevale with a very special walking tour. Follow in the steps of adventurer Giacomo Casanova’s, back the Carnevale of the 18th century. A masked guide will immerse you in the history of Carnevale as well as the use of masks and how they are made. The tour ends with a hot cappuccino and a typical Venetian Carnevele cake, fritelle. If you want a complete Venice Carnevale experience, with many of the activities above, check out Carnival of Venicce package from ItalyVacations.com. This really helped me and was usefull thank u!